Apr 20 What Baby Announcement Fits Your Style? Announcing the arrival of your little one is a special occasion, and finding the right card can take some careful searching. This card may be a keepsake for many family members, or even be framed and hung on the wall. The ideal baby announcement needs to suit both your personality and your little ones. 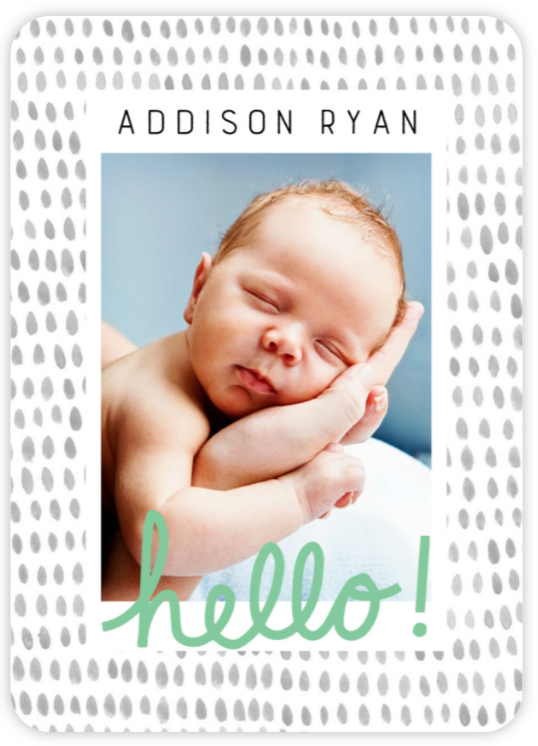 Luckily, our wide selection of custom birth announcement cards gives you plenty to choose from. Whether you favor chic modern styles that look timelessly elegant, prefer cutesie cards featuring sweet Scandanavian-style animals, or you have other ideas you have already conceived, we're here to help. If you're having a difficult time picking out just the right one for you, here's a little guide to help you decide which is the best match. Traditional baby announcements blend gently looping or playful handwritten fonts with sweet details such as floral accents or collage styles to introduce your little one. The collage layouts are ideal if you want to show off several photos in your card. Bright primary colors, playful pastels or classic soft pinks and blues reign in the traditional designs. This ever-popular style may be the first that comes to your mind, and is sure to stay timeless as a treasured keepsake. Keep your baby announcement gentle and heartwarming when you go with a whimsical style. These announcement cards tend to incorporate free-flowing cursive fonts and soft pastel hues to create a free-spirited feel. They may also style themselves around a sweet saying or playful pun to bring a fun twist to your announcement. These cards are a go-to if you want an announcement that feels classic, yet adds a touch of contemporary personality to the occasion. Modern birth announcements frame your little one's photo with simple minimalist detail for a look that is graceful and timeless. Grayscale tones and fresh white space are hallmarks of this refined style. The fonts tend to be elegant and stately, pronouncing your little one's birth with sophistication. Some take inspiration from modern graphic design to blend artistic fonts for a meme-worthy style that is perfectly on-trend. This style may be ideal if you want to frame it and display it on your wall for years to come. The chic design tends to easily accent home decor. Want to add a little touch of glamour to your announcement? Gleaming metallic foil highlights your darling's arrival with just a hint of dramatic flair. This shimmering style is especially a fun choice during the holidays, when metallic details bring bright energy to the season. Whether it's adding a bold border, or simple sparkling accents, foil draws attention like no other as it catches the light. It's hard to resist the cutesie styled baby announcements. Adorned with sweetly simple illustrations of happy animals or whimsical depictions of personified objects, these cards are sure to inspire a smile. If you're an animal lover, playful woodland creatures or farm animals may make this style a favorite. Cartoon-style drawings in others may help to share your glee with friends and family. Choosing a birth announcement card can take time, but should also be fun! Consider this guide to help you identify which styles may be the best fit for you, and then go with your instincts. Each of our cards is designed with care to give you an adorable memento from your little one's first few days.